Coins will come ready to add to your sets and albums. 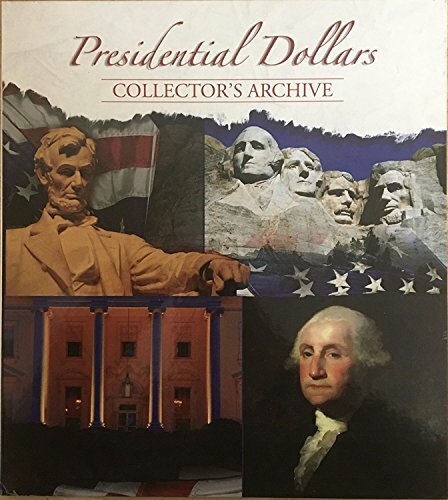 Each eight-coin set features four uncirculated Presidential $1 Coins from the United States Mint at Philadelphia and four uncirculated Presidential $1 Coins from the United States Mint at Denver. Each The dollar coins has a common reverse (tails side) design featuring a striking rendition of the Statue of Liberty. These 2008 coins feature large, dramatic artwork, as well as edge-incused inscriptions of the year of minting or issuance, E PLURIBUS UNUM and the mint mark. IN GOD WE TRUST appears on the face of the coin. 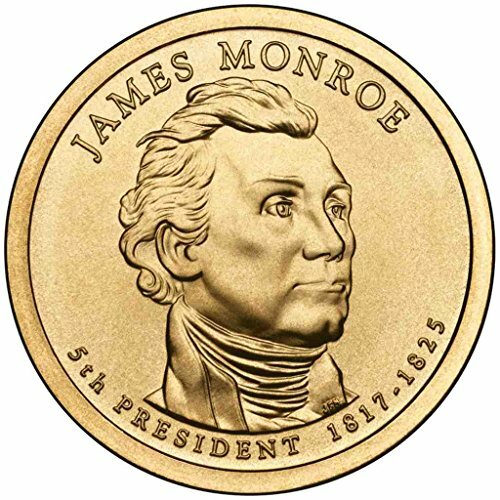 The 2008 obverses (heads sides) of these coins honor these Presidents: James Monroe: This design features an image of James Monroe with the inscriptions JAMES MONROE, IN GOD WE TRUST, 5th PRESIDENT and 1817-1825 . John Quincy Adams: This design features an image of John Quincy Adams with the inscriptions JOHN QUINCY ADAMS, IN GOD WE TRUST, 6th PRESIDENT and 1825-1829 . Andrew Jackson: This design features an image of Andrew Jackson with the inscriptions ANDREW JACKSON, IN GOD WE TRUST, 7th PRESIDENT and 1829-1837. Martin Van Buren: This design features an image of Martin Van Buren with the inscriptions MARTIN VAN BUREN, IN GOD WE TRUST, 8th PRESIDENT and 1837-1841. It's easy to keep your collection up to date! Each Four-coin set features four uncirculated Presidential $1 Coins from the United States Mint at Denver. Each The dollar coins has a common reverse (tails side) design featuring a striking rendition of the Statue of Liberty. These 2008 coins feature large, dramatic artwork, as well as edge-incused inscriptions of the year of minting or issuance, E PLURIBUS UNUM and the mint mark. IN GOD WE TRUST appears on the face of the coin. The 2008 obverses (heads sides) of these coins honor these Presidents: James Monroe: This design features an image of James Monroe with the inscriptions James Monroe, IN GOD WE TRUST, 5th PRESIDENT and 1817-1825. John Quincy Adams: This design features an image of John Quincy Adams with the inscriptions John Quincy Adams, IN GOD WE TRUST, 6th PRESIDENT and 1825-1829. Andrew Jackson: This design features an image of Benjamin Harrison with the inscriptions Andrew Jackson, IN GOD WE TRUST, 7th PRESIDENT and 1829-1837. Martin Van Buren: This design features an image of Martin Van Buren with the inscriptions Martin Van Buren, IN GOD WE TRUST, 8th PRESIDENT and 1837-1841. 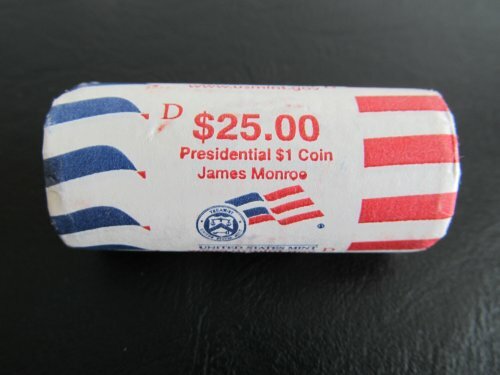 2008 D James Monroe T/T Presidential $1 Coin 25 - Dollar Coin One U.S. Mint Roll From Denver (No White Box). The rolls in the pictures are one that you will receive (1 roll). 1 Brilliant and Uncirculated U.S. Mint Roll 2008 D James Monroe, tail/tail. $25.00 Face value. This roll is new, unopened. Uncirculated coins may vary to some degree because of blemishes, toning or slight imperfections. Toning is the natural result of the minting process and does not affect the grade of the coins. NO WHITE BOX. You get the following Presidential Dollars and a folder to put the coins in. 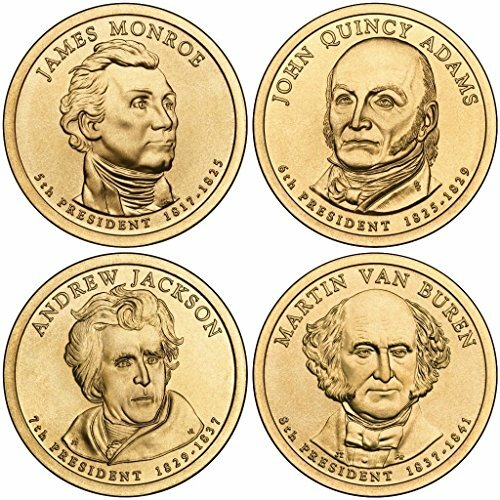 (there will not be any other Presidential dollars made by the US Mint) All coins are fresh From Mint Bank Rolls 2007 George Washington 2007 John Adams 2007 Thomas Jefferson 2007 James Madison 2008 James Monroe 2008 John Quincy Adams 2008 Andrew Jackson 2008 Martin Van Buren 2009 William Henry Harrison 2009 John Tyler 2009 James K. Polk 2009 Zachary Taylor 2010 Millard Fillmore 2010 Franklin Pierce 2010 James Buchanan 2010 Abraham Lincoln 2011 Andrew Johnson 2011 Ulysses S. Grant 2011 Rutherford B. Hayes 2011 James A. Garfield 2012 Chester A. Arthur 2012 Grover Cleveland 2012 Benjamin Harrison 2012 Grover Cleveland 2013 William McKinley 2013 Theodore Roosevelt 2013 William Howard Taft 2013 Woodrow Wilson 2014 Warren Harding 2014 Calvin Coolidge 2014 Herbert Hoover 2014 Franklin D. Roosevelt 2015 Harry S. Truman 2015 Dwight D. Eisenhower 2015 John F. Kennedy 2015 Lyndon B. Johnson 2016 Richard M. Nixon 2016 Gerald Ford 2016 Ronald Reagan. Holder size is 10" x 12" closed and opens 20" x 24". great to display your coins. You'll receive a Bank-wrapped Bankroll of 25 Gem Brilliant Uncirculated 2008-D James Monroe Dollars. This is the last year for edge lettering on these coins, so don't miss your chance to look for errors! We don't search 'em 'cause we're too busy sellin'em. We leave the fun of the search to you! "D" mint mark coins are from the Denver Mint. Size, color and metal composition of the coin will be the same as the Sacagawea Dollar. Bank wrappers vary. It's easy to keep your collection up to date! You get the following Presidential Dollars and a folder to put the coins in. 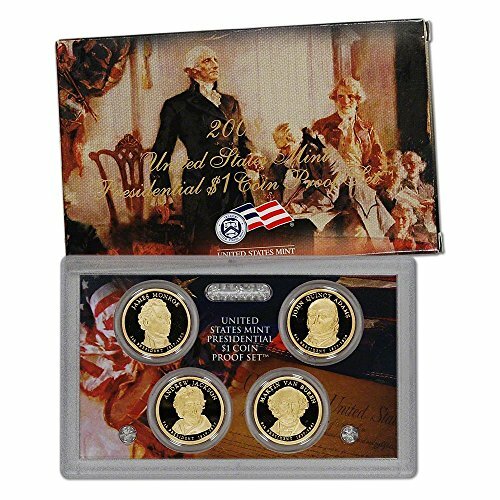 (there will not be any other Presidential dollars made by the US Mint) All coins are fresh From Mint Bank Rolls 2007 George Washington 2007 John Adams 2007 Thomas Jefferson 2007 James Madison 2008 James Monroe 2008 John Quincy Adams 2008 Andrew Jackson 2008 Martin Van Buren 2009 William Henry Harrison 2009 John Tyler 2009 James K. Polk 2009 Zachary Taylor 2010 Millard Fillmore 2010 Franklin Pierce 2010 James Buchanan 2010 Abraham Lincoln 2011 Andrew Johnson 2011 Ulysses S. Grant 2011 Rutherford B. Hayes 2011 James A. Garfield 2012 Chester A. Arthur 2012 Grover Cleveland 2012 Benjamin Harrison 2012 Grover Cleveland 2013 William McKinley 2013 Theodore Roosevelt 2013 William Howard Taft 2013 Woodrow Wilson 2014 Warren Harding 2014 Calvin Coolidge 2014 Herbert Hoover 2014 Franklin D. Roosevelt 2015 Harry S. Truman 2015 Dwight D. Eisenhower 2015 John F. Kennedy 2015 Lyndon B. Johnson 2016 Richard M. Nixon 2016 Gerald Ford 2016 Ronald Reagan. Holder size is 10" x 12" closed and opens 20" x 24". great to display your coins. We just got in a huge Buffalo Nickel Lot. So we are giving out 6 free Buffalo Nickels with each order. They are in Good condition and will comes in a velvet bag. Each 2008-D Jackson Presidential Dollar is in gem uncirculated condition. 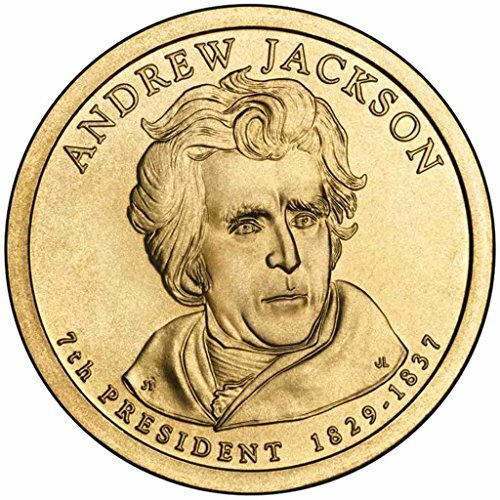 This coin honors our 7th president, Andrew Jackson. Andrew Jackson was a hero of the American Revolution and the War of 1812, and established branch mints at New Orleans, Charlotte, and Dahlonega in 1835. 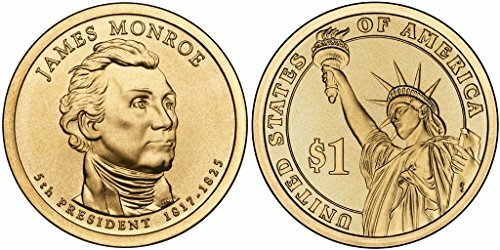 Each 2008-P Monroe Presidential Dollar is in gem uncirculated condition. This coin honors our 5th U.S. president, James Monroe. James Monroe served with distinction in the Continental Army, as U.S. senator from Virginia and as U.S. minister to France, as well as two terms as U.S. president from 1817-1824. The Monroe Doctrine of 1823 forbade European powers from any future colonization of or interference with independent nations in the Western Hemisphere. Compare prices on 2008 Presidential Coins at ShopPlanetUp.com – use promo codes and coupons for best offers and deals. We work hard to get you amazing deals and collect all available offers online and represent it in one place for the customers. Now our visitors can leverage benefits of big brands and heavy discounts available for that day and for famous brands.